Piqua, Ohio, April 9, 2015 – Hartzell Propeller Inc. has begun an active schedule of aviation trade show appearances in 2015. Coming off a successful exhibit in Bangalore at Aero India, the propeller manufacturing company has exhibits scheduled at AERO Friedrichshafen in Germany and then a full slate of U.S. aviation trade shows. At AERO, April 15-18, Hartzell Propeller will feature its recently Type Certificated two-blade Bantam propeller for Rotax 912 and 914 series four-stroke engines. Hartzell Propeller experts will also be on hand to discuss the company’s full range of high performance propellers, spinners and governors. 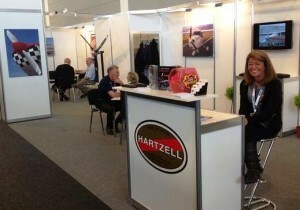 Hartzell will be exhibiting at Hall-Stand A3-124.